TUALATIN — They're going to get everyone's best shot. Everyone is going to be fired up to play them. They've definitely got a target on their backs. And the Timberwolves wouldn't have it any other way. 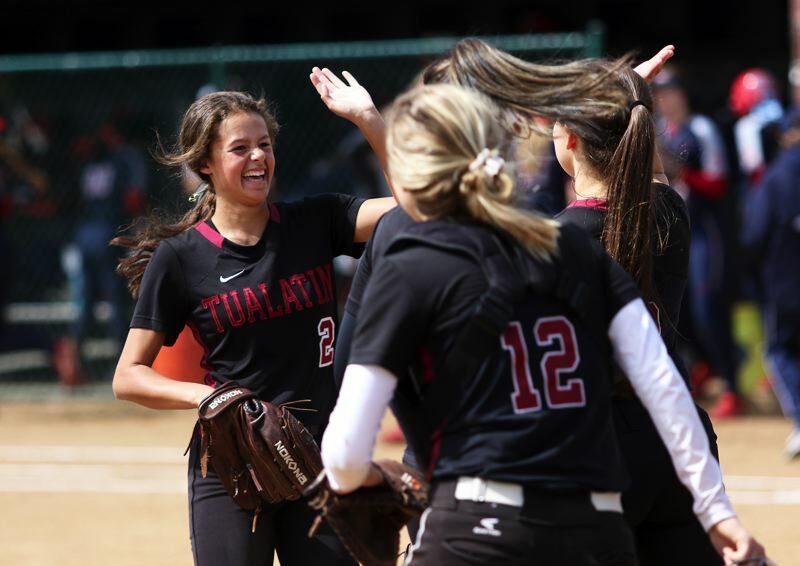 The unbeaten, and top-ranked Tualatin High School softball team looks to be ready for any and all challengers. And, on Saturday, the Wolves fought off another challenge — this one from a traditional state power — as they came away with a 5-0 win over Westview in a non-league game played at Tualatin High School. 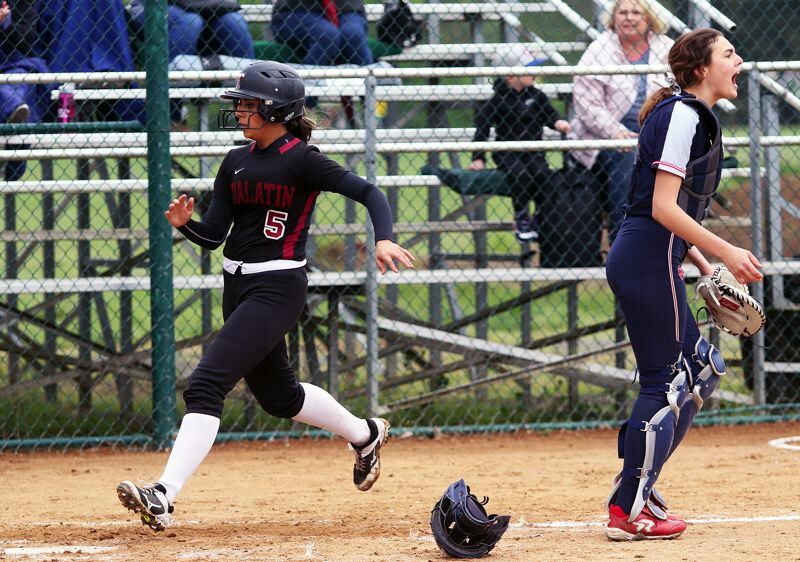 "We've got a target on our backs," said Tualatin junior second baseman Andrea Gomez, who doubled and drove in a run in the victory. "That's motivation for us. We came out energized today." "We're motivated to stay at No. 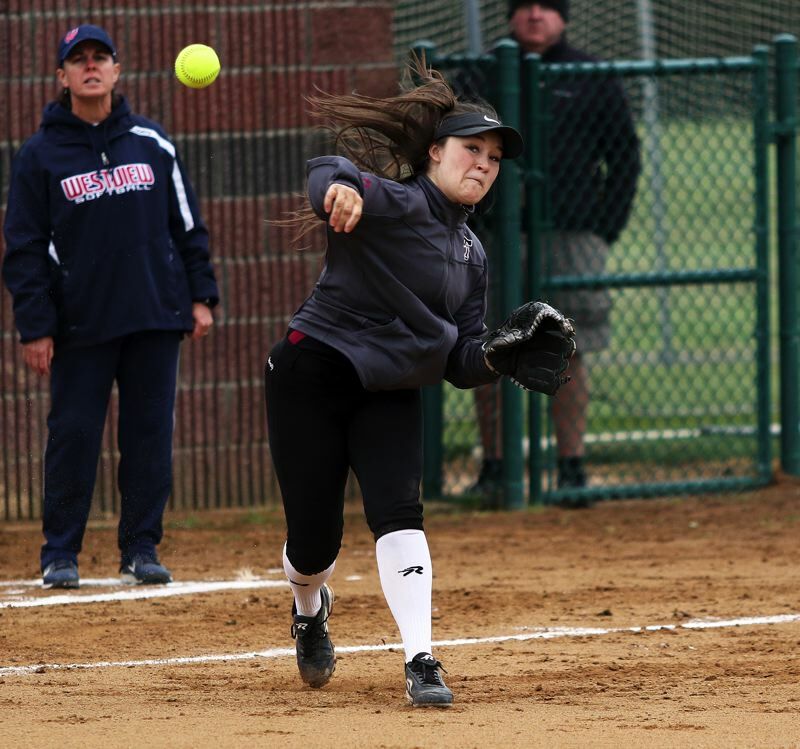 1," added Tualatin sophomore Tia Ridings, who had a hit in the contest while also making a spectacular, run-saving catch in right field in the victory. "We know that everyone wants to beat us. It was a lot of fun today." With the victory, Tualatin, the No. 1 team in the OSAA power rankings, improved to 17-0 on the season to that point. "Everything we're doing now is getting us ready for the championship game," Gomez said. "That's definitely a team goal," Ridings added. Westview, which played in the 2017 Class 6A state championship game, and is in a battle with Glencoe and Jesuit for the top spot in the Metro League, moved to 14-6, at that point, with the setback. "This didn't go as we hoped," said speedy Wildcat outfielder Reece Martin. "But we'll learn from it. When you lose a game, you can dwell on it, or you can learn from it, and we'll learn from this one." Martin, Westview's leadoff hitter, had an infield single to start the game. 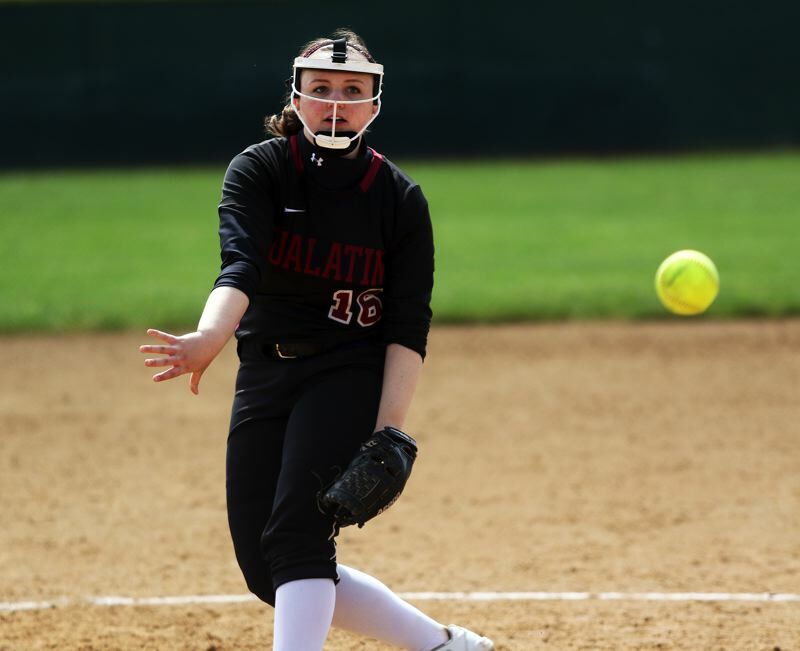 She stole second base with two outs in the opening inning, but Tualatin senior pitcher Megan Woodward got a strikeout to get out of the jam. The Wolves were then able to break the scoreless tie with a pair of runs in the bottom of the second inning, doing all their damage after their were two outs and the bases empty. 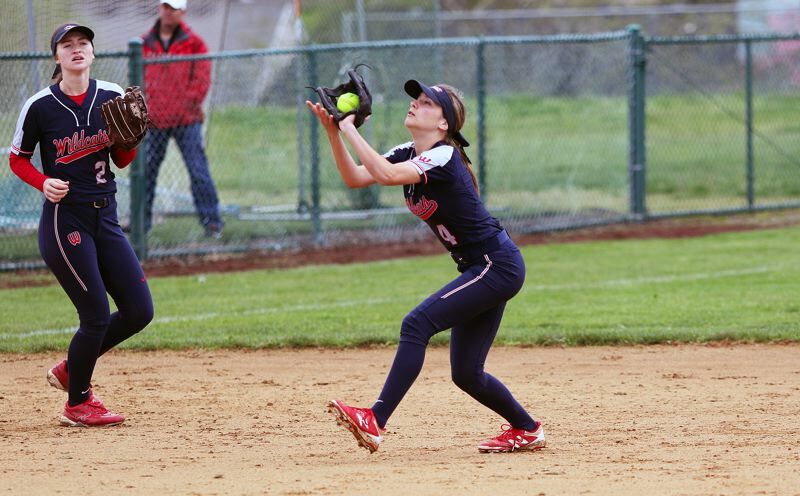 Senior Zoe Olivera got things going when she was hit by a pitch. 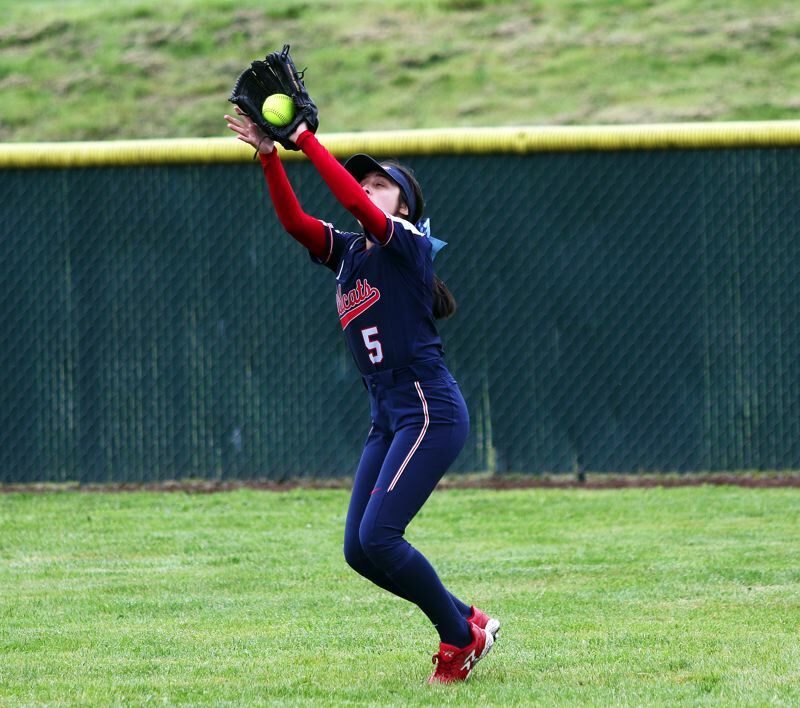 Junior Lily Marshall then reached first base on a Westview errors, with Olivera moving to second on the play. Tualatin freshman Taylor Corcoran then singled to left-center field, driving in Olivera with the game's first run. Ridings and sophomore Bella Valdes followed with back-to-back singles, with Marshall scoring on Valdes' hit, giving the Wolves an early 2-0 advantage. 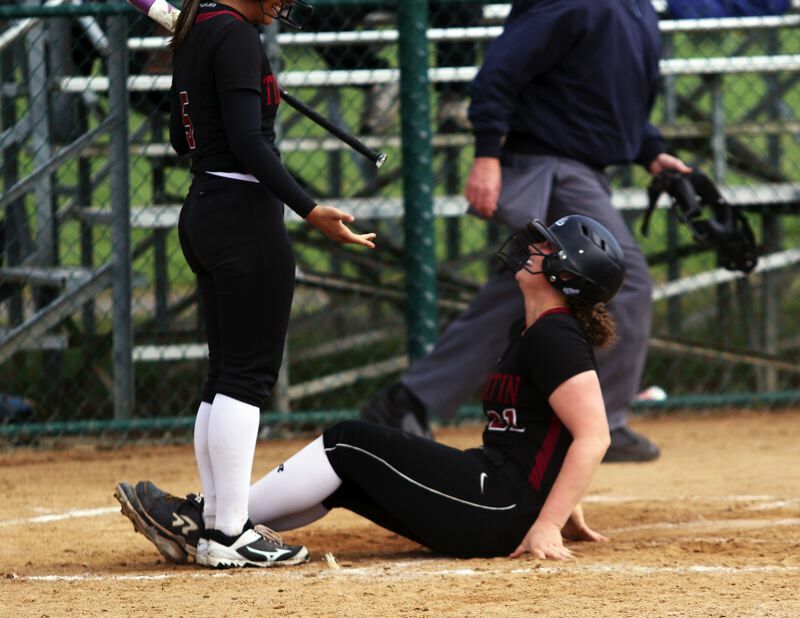 Tualatin struck again in the bottom of the third inning. Senior Taylor Alton, junior Emily Johansen and senior Ella Hillier opened the frame with consecutive singles, loading the bases with no outs. 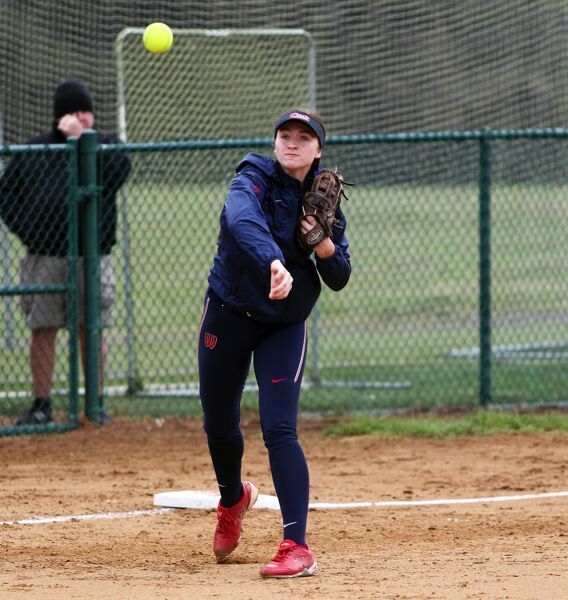 Freshman Julia Jordan, taking over the pitching duties in relief for Westview at that point, struck out the next two batters, but the Wildcats then committed an error on a grounder by Marshall. Alton and Johansen both scored on the play, upping the lead to 4-0. 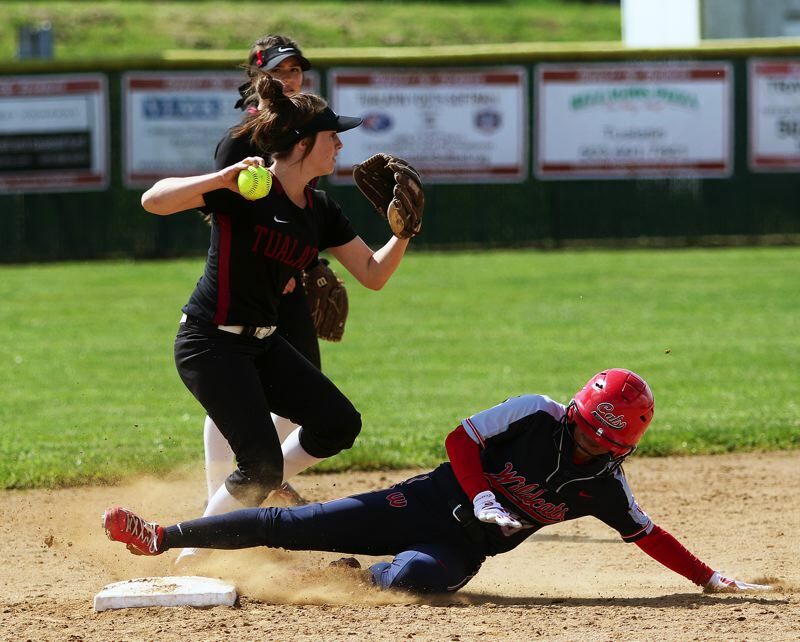 Tualatin scored its other run in the bottom of the sixth inning, when Gomez doubled in Johansen, who singled to lead off the frame, pushing the margin to 5-0. Meanwhile, Westview kept trying to battle its way back into the game. The Wildcats got a one-out single by senior Kelsey Day in the top of the fourth inning. They also got a leadoff single by sophomore Madeline Curaming in to the top of the seventh. But, both times, the runners were left stranded on base. Westview's top scoring chance came in the top of the sixth inning. Senior Taylor Alto hit a one-out single to center field and sophomore Mia Patino then reached base on an error. Both runners then moved up on a wild pitch, putting runners on second and third with one out. Then, after Woodward got a strikeout for the second out of the frame, senior Annika McNeel hit a fly ball toward the line in right field. But Ridings came sprinting over, making a reaching catch right by the foul line for the third out of the inning, likely saving a pair of runs. "I was really nervous, because I had shifted over the other way because of a left-handed hitter," Ridings said. "I couldn't have done it if I wasn't 100 percent sure that (centerfielder) Zoe would be backing me up." 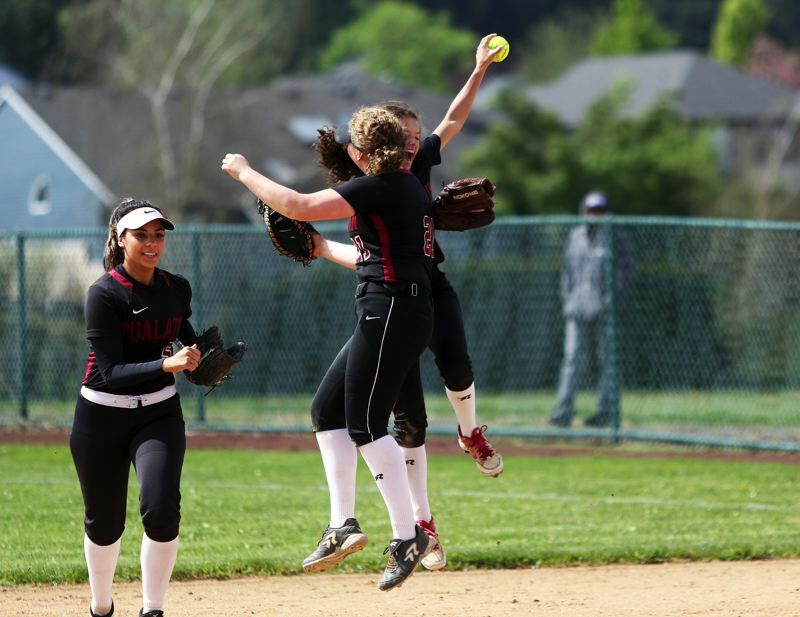 Tualatin, as a team, had nine hits in the victory. Johansen and Hiller each went 2 for 3 at the plate, with Johansen scoring a pair of runs. Valdes, Alton, Corcoran, Ridings and Gomez added one hit apiece. "We had good communication," Gomez said. "We all talked about what their pitchers were doing, and we adjusted." Woodward, in getting the complete-game shutout pitching victory, gave up five hits, while striking out 13 and walking none. "This was awesome," Ridings said. "It was fun for everyone." For Westview, Martin went 2 for 3 at the plate. Alto, Day and Curaming added one hit apiece. "It was two good teams, and the first couple of innings were exciting," Martin said. "The whole team is evolving, and growing together. We're growing, and having fun." The Wildcats bounced back on Monday to get a key 6-2 win over Sunset in a Metro League game played at Westview High School. Freshman Emma Antich went 2 for 2 at the plate with two RBIs for the Wildcats in the victory. Sophomore Kendra Hutchinson went 2 for 2 with a run scored and an RBI. McNeel and Jordan combined to pitch Westview to the win. 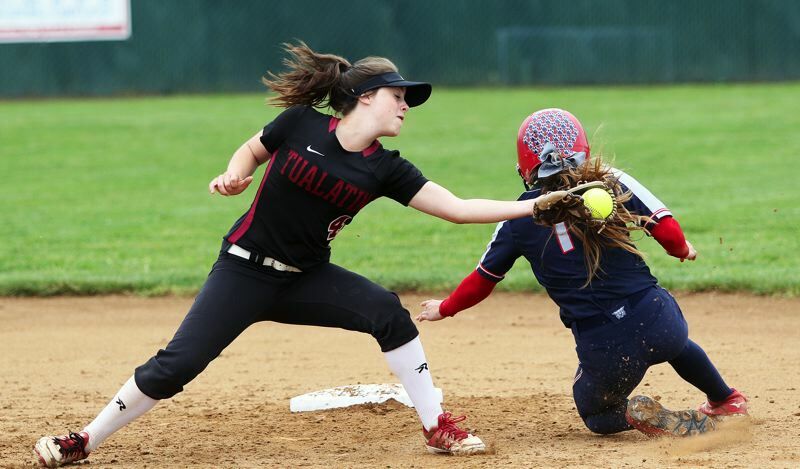 Tualatin, on Monday, scored a 7-0 home win over Lakeridge in Three Rivers League play. Johansen went 2 for 4 at the plate in that game, with a double, a run scored and three RBIs. Alton went 2 for 3 with two runs scored and an RBI. Valdes went 2 for 4 with two runs scored. Woodward and Ridings combined to get the shutout in the pitching circle. The combined to give up six hits, while striking out 12 and walking none. 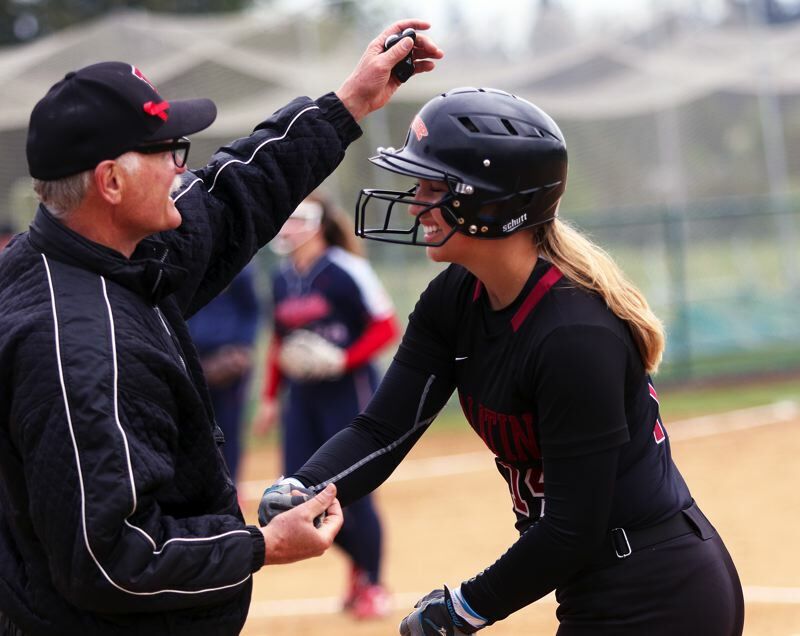 On Tuesday, Tualatin will play at Canby in a Three Rivers League game starting at 4:30 p.m. On Wednesday, Westview will travel to Beaverton for a 5 p.m. game and Tualatin will host Lake Oswego at 5 p.m.